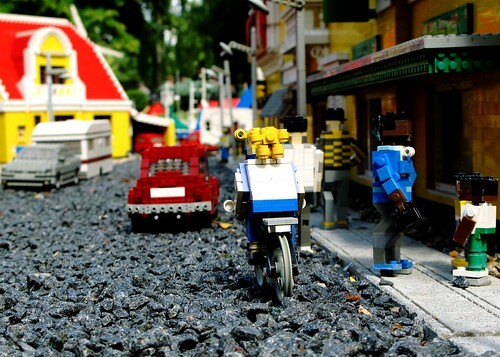 You'd expect LEGO, being Danish, to have featured the bicycle amongst their products. There are no bicycles in my boy's 10 kg pile of LEGO - a potpourri of Lego spanning 35 years and including the new stuff, my childhood lego and my little brothers, too - but I've seen them before. So a little googling brought me to this nerdy website listing sets that include LEGO bicycles. I slapped a number of the photos into the graphic above and included a couple of images I found on the internet. My favourite is at bottom left. A petrol station shop. A cyclist pedals calmly away carrying an ice cream in one hand and fresh flowers in her panniers. She is glancing over at a motorist who can't control his vehicle and who, it appears, forgot his change. I like the contrast. Above there is Café Corner, with a bike parked out front, of course. Two of the shots feature merchandising for the German Team Telekom from back in 2000. The Tour de France is [has been] such a major cultural event in Europe for so long and Germany is one of LEGO's biggest markets so no surprise about this merchandising marriage. At the bottom right are a collection of Community Workers featuring three bikes, including a cop and a fireman on bikes as well as two mechanics. 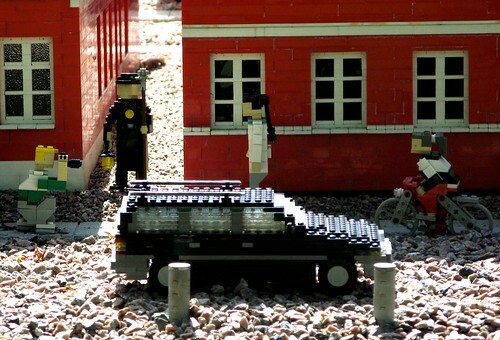 I've probably posted this before, but if you go to the Danish Legoland, you'll see Copenhagen Cycle Chic in brick form.